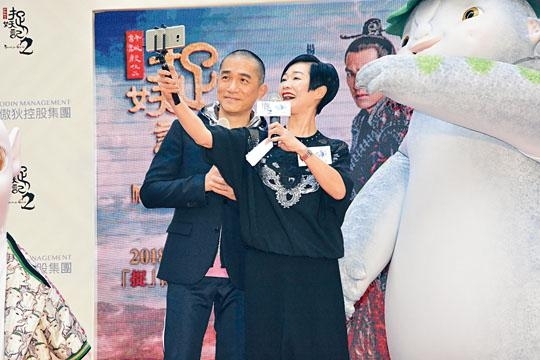 Tony Leung Chiu Wai yesterday attended his film MONSTER HUN 2 (JOOK YIU GEI 2)'s "Wuba giant balloon launching". 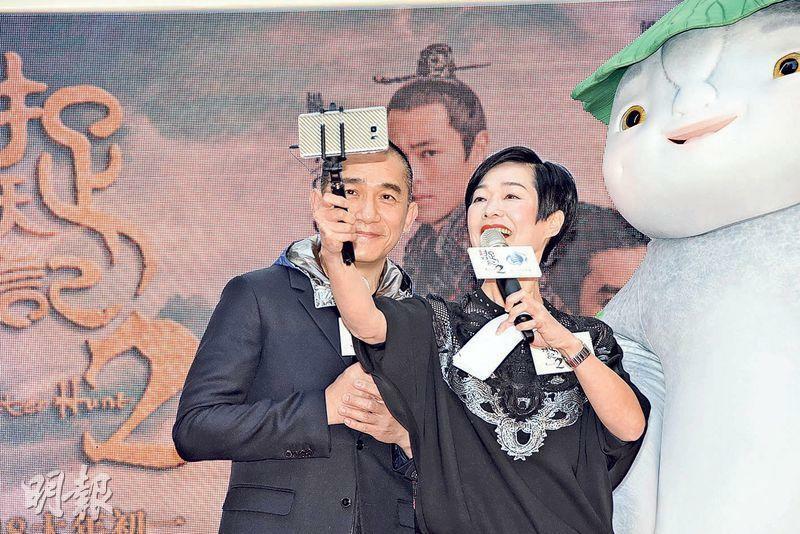 Rarely making public appearances, Wai Jai not only attracted many to look on and take photos but also the event host Yam Yuk Ying asked him for a selfie on the stage. Playing the electrifying eyed gambler in the film, Wai Jai was asked if he had any sure win secret to betting? Wai Jai said, "In the Lunar New Year I would play mahjong and cards like ordinary people, but whether I lose or win I would leave after playing for a few minutes. This is the secret." Wai Jai said that he has not attended an outdoor promotional event in years. The last time was the film INFERNAL AFFAIRS (MO GAN DOH)'s outdoor promotion. Would he appear more in Hong Kong? He said, "I hope so, normally when I am not working I rarely go out." He said that his new hair cut was easy to take care of. Because he liked to water ski and ski, sometimes when he stopped and rested in the middle he would run into people asking for photos. He did not know whether to agree or not because his hair would stand up like he just woke up. Wai Jai said that he just returned from skiing in Hokkaido. His wife Carina Lau Ka Ling was busy at work and did not go with him. They would go again after Lunar New Year's Day. He also revealed that he would spend this Lunar New Year in Hong Kong. In past years he went skiing, but the location would be too slippery for Mommy. He would probably be in Hong Kong on Valentine's Day too but he probably would prepare any special gift. Has he seen Ka Ling's film IN YOUR DREAMS? Wai Jai said that he still has not have the time to. "I haven't seen a lot of movies yet. Because Ka Ling and I had to vote for the Oscars, we got 60 to 70 movies to watch. I wanted to watch some at the movies. Now I have seen a few, but at most I would watch three a day. (Has Ka Ling seen all the movies?) Definitely not, she is so busy. (Ka Ling said that the lead actor Ng Siu Hin resembled you?) Useless like me. (Do you agree?) I haven't even seen his picture, I only know he's new. I would mainly watch how she did." For this Lunar New Year, Wai Jai and Ka Ling would face off. Wai Jai said that he has not made a Lunar New Year film in a long time. He also said that if Ka Ling would invite him he would ask her film's Valentine's Day premiere. Tam Yuk Ying said that the last time she saw Wai Jai was already ten years ago. Each time they met they would catch up. Has she thought about a dinner with fellow 430 SPACE SHUTTLE hosts? She believed that it would be rather hard. Speaking of rumors that she has already secretly wed her first boyfriend 20 years ago, she seemed to be prepared when asked if she was married. "Seemingly when I got married I really have to announce it. Right now I am very happy, can't you tell? (Would you not officially say whether you are married or not?) I haven't thought about it, now I am very happy, I am very pleased with everything. It was my choice, no one forced me. (Would you take the extra step and sign the paper?) People would always change their minds, I really don't know."